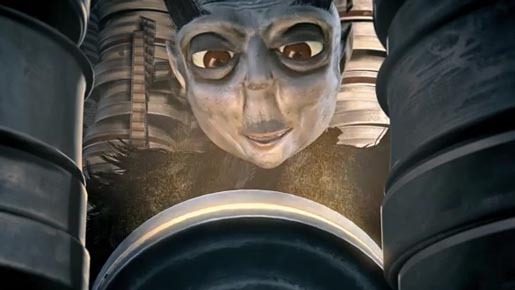 Australian television channel SBS is promoting its online world of film, SBS Film, with two 60 second animated short films, “Let There Be Light” and “The Vault”. Launched in September 2010, the two films present a dark world in which a projectionist searches for films. SBS presents world movies on two channels, SBS ONE and SBS TWO, while online, www.sbs.com.au/film has an international round up of reviews, trailers, local and international festival news and film information. The two SBS shorts were developed at US Sydney by executive creative director/art director/copywriter Josh Moore, creative director Chad Mackenzie, art director Danny Wehbe, copywriter Giuliana De Felice, agency producer Sacha Moore, account director Alex Tracy, account manager Tim Stuart. Filming was produced at Plaza Films, Sydney, by director Helen Clemens, producer Belinda Mayne, and lead 3D artist and designer Pete Commins. Post production was done at Cutting Edge. Sound was produced at Nylon Studios by sound designer Tone Aston, composers Michael Yezerski (The Vault) and Scott Langley (Let There Be Light), and music producer Karla Henwood.